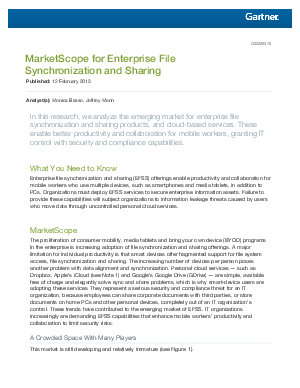 In this Gartner MarketScope 2013: Enterprise Sync & Share research report, Box, Accellion and Citrix are the highest rated vendors with a "Strong Positive" rating and are considered the most secure and mature in the category and considered "enterprise class". These three vendors represent the cream of the crop, gold standard for this emerging technology category today. The next tier of vendors being considered are Acronis, EMC Syncplicity, Good/Copiun, WatchDox and YouSendIt/Hightail, who received a "Positive" rating. Egnyte and Oxygen Cloud are "Promising" but not yet enterprise class. Gartner also takes a strong stance against Personal Cloud Services such as Dropbox, Apple iCloud or Google's GDrive without IT Oversight.